The Prairie Pothole Region (PPR) is named for the millions of shallow depressions left behind by glaciers thousands of years ago. These wetlands support globally significant populations of waterfowl. In addition, the prairie grasslands in this region are of significant importance both ecologically and for grassland dependent birds. Yet, the wetlands and grasslands are significantly declining from agriculture, energy and other development. The region is now the most threatened breeding waterfowl habitat in the United States. Conservation action is urgently needed to address this crisis in the prairies. Intensification of agricultural production and renewable and nonrenewable energy development are threatening an already imperiled biome and the birds and wildlife that depend on it. This habitat loss not only impacts wildlife enjoyed by people across the North American continent but also landowners concerned about the loss of a way of life, and areas far away that depend on clean water and pollinated crops. Fortunately, partners continue to commit public and private funding to conduct wetland and grassland conservation in the U.S. PPR. PPJV partners use science to efficiently guide the allocation of funds and leverage millions of dollars of matching funds. Funding from the sale of Federal Migratory Bird Hunting and Conservation Stamps (i.e., Duck Stamps), the North American Wetlands Conservation Act, Land and Water Conservation Fund, and numerous state funding sources are allowing PPJV partners to make impressive conservation progress. Private funding from individuals, corporations, and foundations play a vital role in PPJV conservation efforts. Moreover, programs associated with the Farm Bill are allowing NRCS and FSA to target dollars to important areas for wildlife across the prairie region. However, habitat loss is outpacing the rate of conservation, so more needs to be done. Private landowners, public landowners, recreationists, and people who benefit from grasslands and wetlands can learn more about these concerns and policies, programs, and activities to conserve the Prairie Pothole Region in this section. Click on the links below to get started. Hear how people benefit from prairie conservation in their own voices. PPJV works with the Prairie Habitat Joint Venture from Canada to coordinate conservation activities in the entire Prairie Pothole Region. 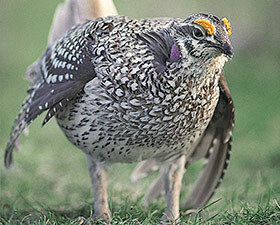 Landowners play an essential part in prairie conservation in the region.